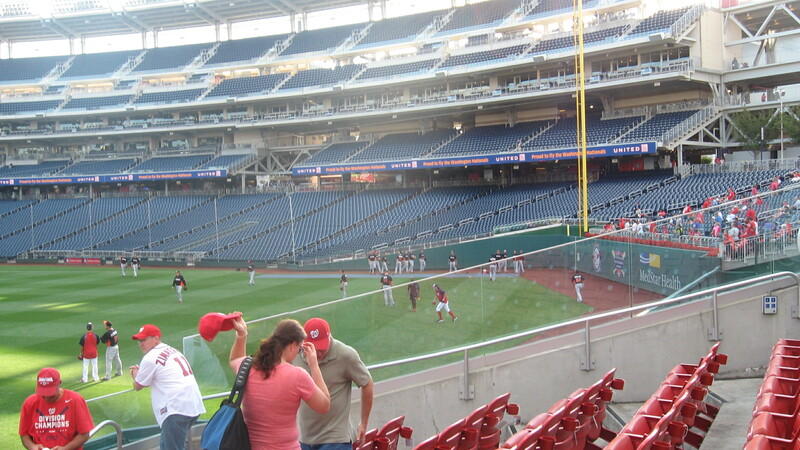 This season at Nationals Park, I had not had much luck in the way of ball-snagging due to rained-out batting practice and overall lousy luck. 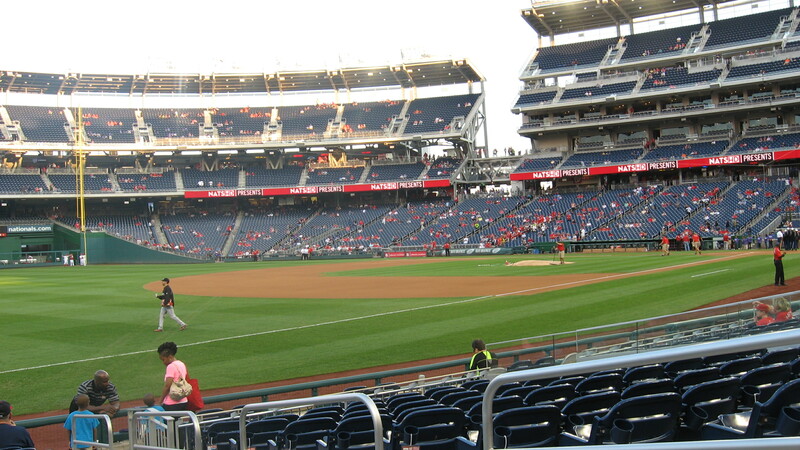 The Marlins were set to come to D.C. one final time for the season, and I jumped on the opportunity. I was ecstatic for my final baseball game of 2013: a warm, sunny Friday night with the prospects of low-attendance and full batting practice. I attended this game with three friends: Jack, Ben, and Paul, all of whom I go to school with. We bought $6 seats on StubHub in section 106, but never actually sat there. More on that in a bit. Since we had to travel by Metro to get to the game, we did not arrive until about 5:15–45 minutes later than I had hoped, but not too late for the Marlins session of batting practice. I had briefed the other guys about ball-snagging during BP, and they were all very interested to see the glove trick in action. Luckily, when we walked down into the Red Porch, there was a ball sitting in the gap between the wall and seats just waiting to be rescued. I quickly had our first ball of the day. A shot of me glove-tricking from last September. Same concept. I turned around to take a picture, and Jack was telling me to put away the glove trick. Why? A fan behind him, who I later learned is an acquaintance of Zack Hample, had said that he had his glove confiscated earlier this season for doing the same. He pointed out to me the security guard, whom I did not recognize, that had busted him. The Nationals fled the field not a minute later, and Paul, a huge Nats fan, was a bit perturbed. He said his goal for the night was to catch just one ball. Pretty soon, a line drive one-hopped the fence and stopped on the warning track. Jake Marisnick, a semi-recent call-up, was nearby. I figured he’d notice me if I said yelled his first name, so I did. He turned around and I politely asked if he could toss the ball up. Success. Number 2. 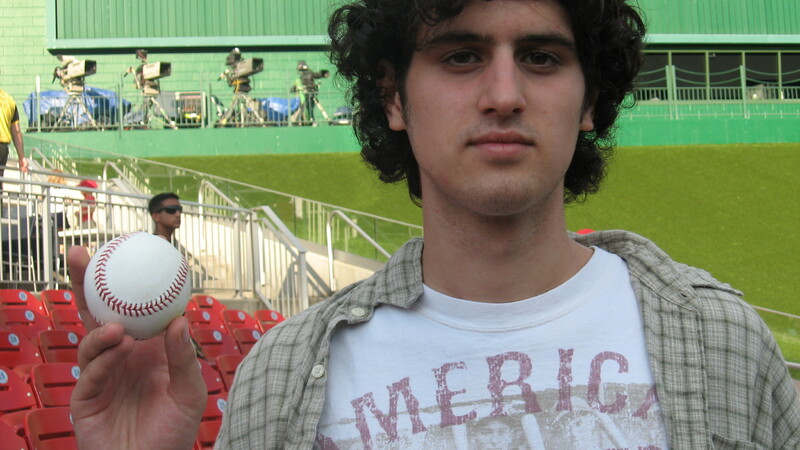 Ben holding up one of the first balls. Another opportunity presented itself a bit later when Henderson Alvarez chased down a fly ball right in front of the porch. I asked for it in Spanish, and he tossed it into the frenzy of fans in the front row. Luckily, my glove was outstretched farther than anyone’s hands and I had my third ball of the day. This entire time, Jose Fernandez was incredibly entertaining as he chased down fly balls, frolicking wherever he pleased. I cringed when he ran into the center field fence shades of Mariano Rivera, but luckily Fernandez did not injure himself. He tossed countless balls into the crowd over the course of BP. Most of which he just threw to random spots, not particular fans. 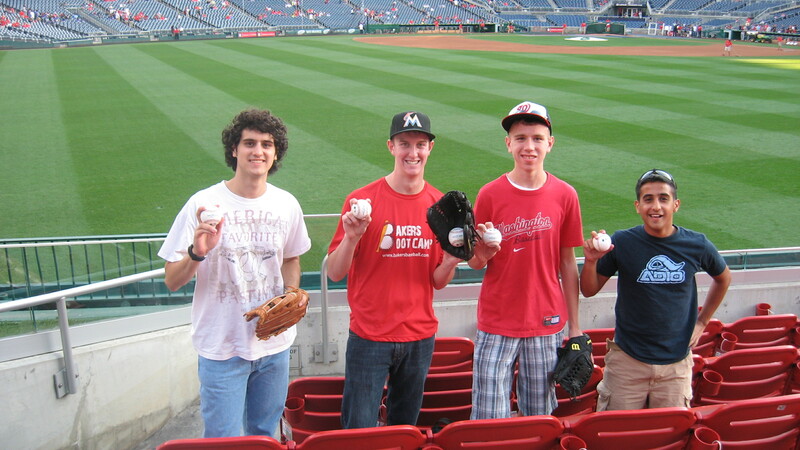 I was lucky enough to catch one (#4), but I gave it away to a nearby fan who had a glove and had not caught one yet. The highlight of BP was a catch that Jack made on a Giancarlo Stanton bomb. Jack with his spectacular catch! Stanton normally hits opposite-field during his first few rounds, so all of us were ready when he started unleashing to left and left-center. One shot was an absolute laser that was headed for the center field side of the Porch. I was in the middle at the time, and raced to my left to get into position. I jumped at the last second, and the ball eluded my glove. SMACK. I turned around and saw Jack with his glove closed and a look on his face that said, “Yeah, I caught that. And didn’t even have to move!” It was slick. Among the four of us, we had five balls at this point. A long dead period ensued. Overall, there seemed to be a lot fewer home runs hit into the Porch than in games past. Last September, I caught four home runs at the Red Porch during one session. But the opportunities were just not present this time. I told Christian I’d put him on my blog. And he smiled for the camera! Anyway, I ended up getting one final ball from Christian Yelich. 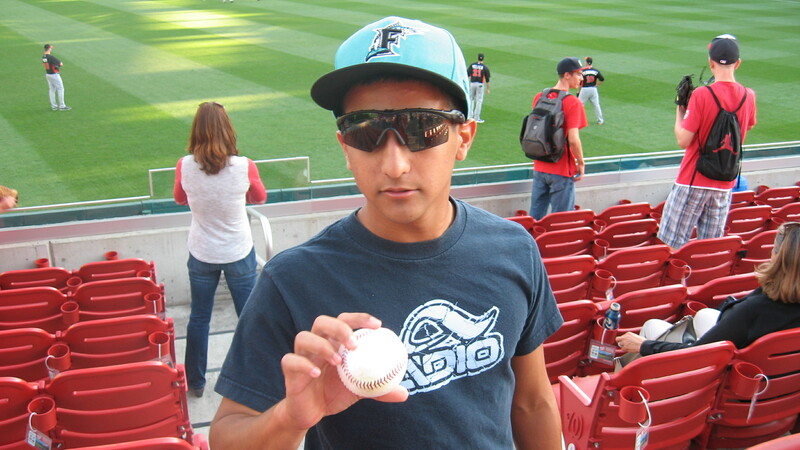 I was at the center field end of the Porch when a ball rolled up against the fence. 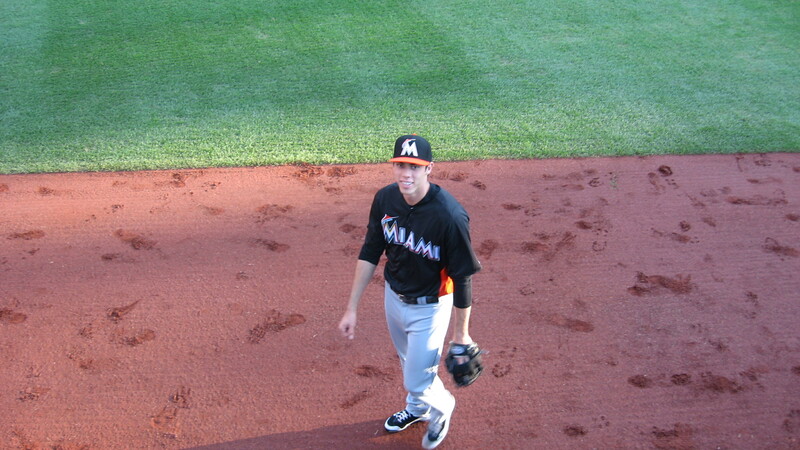 As Yelich approached it, I politely asked for it and told him I’d put him on my blog. He smiled for the camera and tossed me the ball! 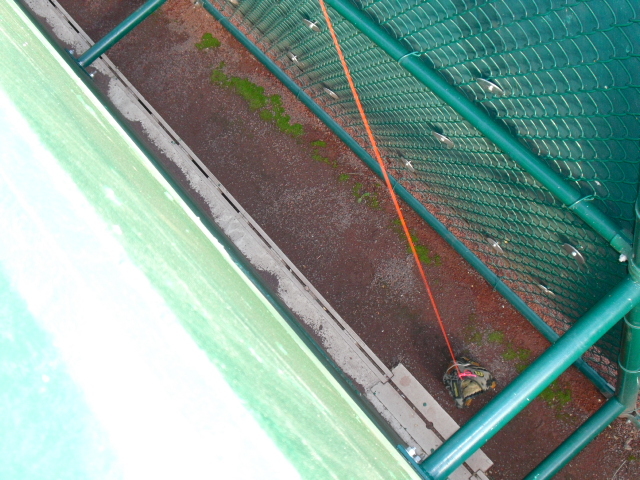 Two more balls ended up in the gap over the period of BP, but I never tried to retrieve them out of fear that my glove would be confiscated. But Ben had convinced me that if the guard were somehow distracted, I could easily pluck one of the balls out. So Ben and Jack went up the steps to go ask the guard if they could somehow get the balls that were sitting on the batters’ eye, right next to the seating area in center field. As they were doing this, I looked down an saw a fan with his own glove-trick rescuing one of the balls. The guard didn’t notice. But a few minutes later he did when a different fan retrieved a ball of his own. The mean-looking yellow-shirt came down the steps and told the fan to put it away. 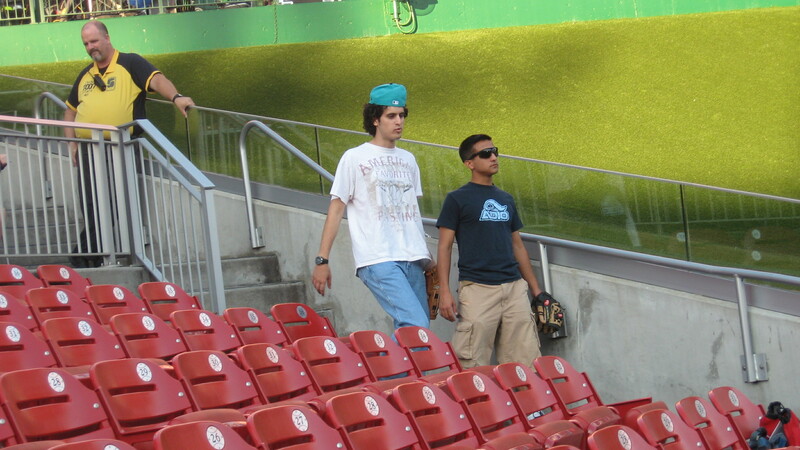 I was not close enough to hear the conversation; however, I noticed that the fan did not get his glove taken away. Ben and Jack walking back after trying to distract the guard. The three balls on the batters’ eye did end up being retrieved, but none of us were worthy recipients. According to Ben, the guard had told him, “if you’re old enough to mow the lawn by yourself, you won’t get one.” Discrimination. Paul was still bummed because he was without a ball, and was actively trying–as opposed to Ben, who was just milling around wearing my teal Marlins hat. I gave one ball each to Ben and Paul, and we took a picture. Sweet! From left to right that’s Ben, me, Paul, and if you look really closely you can see a small blue figure on the far right–that’s Jack. Poor Jack has a bunch of friends who are over, and well over 6 feet tall. Paul was astounded that I had caught five balls at one game, but he had never attended so much of batting practice before, so it makes sense that he would be shocked at that number. I told him if we had been there at 4:30, I would have had five more. Before the game, we decided that we should try to practice the art of seat upgrading and not even bother to enter our section. Our tickets were for 106, which I picked mostly for home run catching opportunities; however, no home runs were hit at this game so that wouldn’t even matter. We entered section 111, which was not being guarded by an usher at 6:40, and found an empty area a dozen or so rows back from the field. Not five minutes later, a pack of people walked down and said that we were in their seats. Evidently, there was a huge group that had tickets in 111, so we had to move a few times, but were luckily never caught by ushers. We knew that we could not leave during the course of the game because we did not have real tickets to get back into section 111. However, during the fifth inning, Jack found a ticket on the ground (for section 111), and Ben suggested we use it to our advantage. I explained to them that two of us could get in on the one ticket if one of us were carrying an armful of food. All we would have to do would be show the one ticket, and we’d both be allowed in. So two at a time, we left. Ben and I got shakes from Shake Shack as Donovan Solano broke up Jordan Zimmermann’s no-hitter in the sixth inning. We missed about five runs in the bottom of the sixth while we were getting the food. Later, Jack and I left to get more food. Unfortunately, when we returned, Ben and Paul had been moved over by a family who had just arrived at their seats. What?! It was the SEVENTH inning! Luckily, there was an empty seat on the aisle in the row in front of us, so I was able to sit there without consequence. The families in that section soon left the game, and I got my seat back. The Nationals won a lot to a little. And the Marlins still have not won in D.C. this season. Jordan Zimmermann pitched a brilliant two-hit shutout, striking out nine batters along the way. After the game, I gave one more ball away to a little kid, and the four of us wandered up to the MASN booth to watch the postgame show. 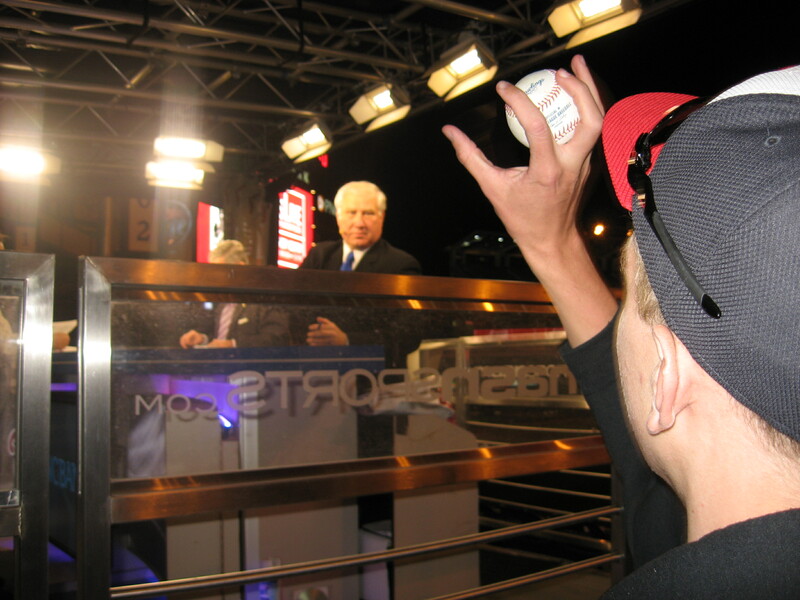 Paul really wanted an autograph from Ray Knight, and promptly asked him upon the first commercial break. Ray was very cordial and signed the ball with an ” ’86 World Series MVP” inscription. That interaction was absolutely awesome. Before Paul’s parents drove us back to the Metro stop in Virginia, we played catch in front of the Department of Transportation building with barely enough light to see an airborne baseball. No one got hurt except the tree than Ben hit a few times. Thanks, dude! This was most certainly the most fun I had a Nationals game this season, mostly because BP actually happened, and of course because of the entertaining company. Final score: Nationals: 8; Marlins: 2–hits that is, they scored ZERO runs; me: 5 balls because I knew the Marlins’ players’ names; Jack: 1 ball, but the awesomeness factor of the catch counts for 5 more; Paul: 0 balls because he refused to a) wear my Marlins hat, and b) plead in Spanish. But his autograph from Ray Knight and t-shirt from the t-shirt toss make up for that; Ben: had a good time. 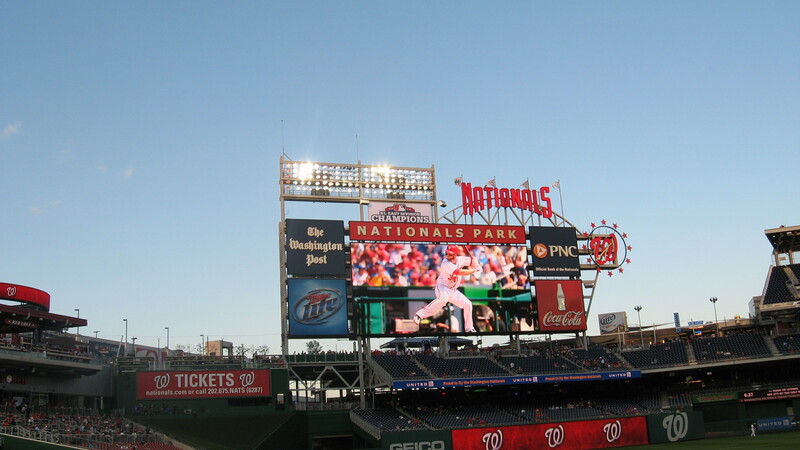 So long for just a while, Nationals Park. Next Believe It: Henderson Alvarez spins walk-off no-hitter!